Showing 37 articles from September 26, 2018. LOUISBURG -- Hurricane Florence churned slowly, pounding southeastern North Carolina with winds and several feet of rain -- flooding nearly everything in her path. 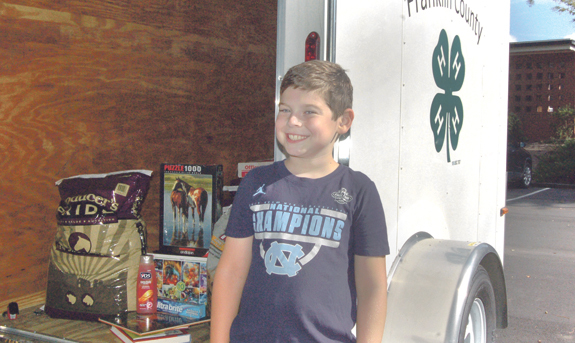 While the storm spared Franklin County, it did whip up a tornado of activity -- as residents rushed to gather supplies and support for those whose lives were battered and bruised in Florence's wake. LOUISBURG -- Franklin County leaders are moving closer to having a new, permanent finance director. And, they're eying a new airport director, too. From June until Aug. 13, 24 people submitted applications for finance job, said County Manager Angela Harris. Between Harris, Assistant County Manager Kim Denton, human resources staff and Interim Finance Director Chuck Murray, they narrowed that list down to four or five who warranted interviews. YOUNGSVILLE -- Within 75 days, Steve Straus told Youngsville commissioners that they could help them find their man ... or their woman. Commissioners chose his Durham-based Development Associates company to help land their next town manager and Straus said their in-depth process can help them weed out those who talk a good game and find a manager that plays one. 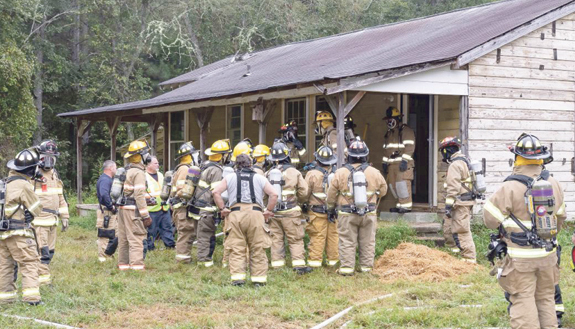 STEM -- Students and instructors from a Vance-Granville Community College Fire Control class, including students from Franklin, burned an abandoned farmhouse on land owned by Tar River Land Conservancy (TRLC) in Granville County. The Sept. 9 burn was conducted to simulate the conditions faced by firefighters responding to residential fires. Turning the green you see into green you spend! CASTALIA -- Outside the doors and windows of most homes in northeastern Franklin County, people see a lot of green. There's green grass and green trees. David Knight, director of the newly minted State Office of Outdoor Recreation Industry, told members of the Northeast Franklin Revitalization Committee that all over the state, folks are turning natural green into green dollar bills. You've read about the overall grades that Franklin County Schools have achieved from our beloved state -- but there is a lot more information in those reports that explains much about the state of public education locally -- and is well worth your time to review. Let's take a look at some comparisons and see how county schools stack up against the averages posted statewide. 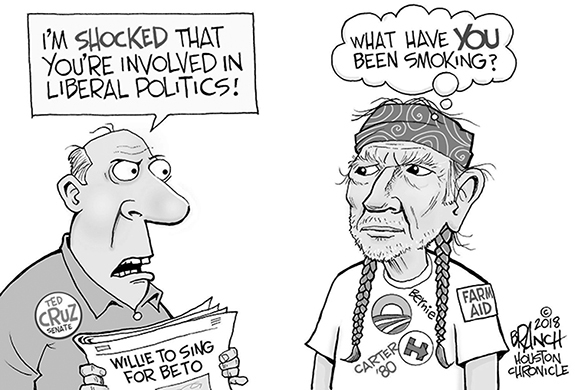 We looked and looked but the humor still eludes us! Sorry, we hunted and hunted, but we couldn't find it. It's not like we didn't try, either. Long walks, intense discussions and time to ponder didn't help much. By the time this hits the news racks, I will have been a Franklin County resident for two weeks. I've gotten my address changed on my driver's license. I've gotten my address changed on my vehicle registration. And, as we speak, I await my first Franklin County utility bill. Dear editor: In regards to the article "Commissioners appoint one of their own to hospital board," I'm not sure how the other citizens of Franklin County feel regarding the nominations, but I feel like it is a slap in the face to every citizen here that the commissioners only feel that one person in Franklin County is able to serve on the hospital board. And that person is a commissioner. Wow! 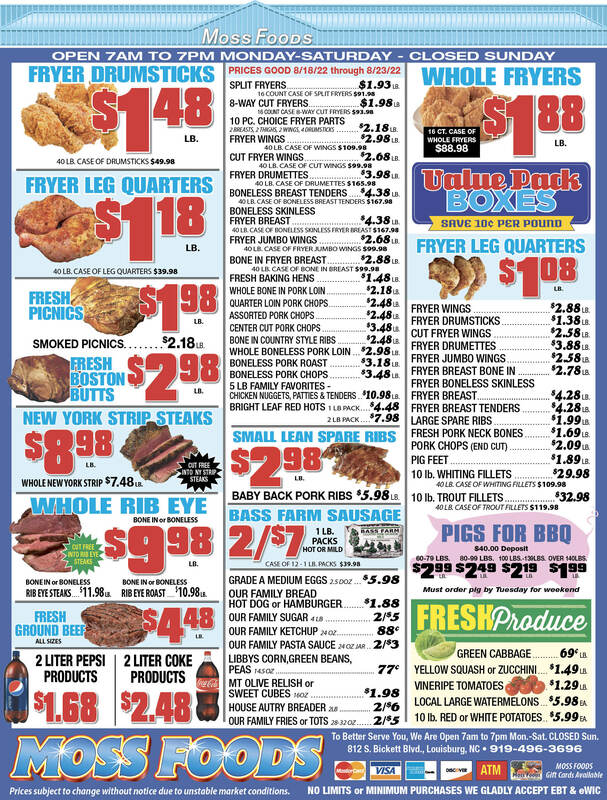 I've been enjoying The Franklin Times since I moved to Louisburg from Raleigh this summer. I moved here to live a small-town country kind of life. I intend to live here for a long time. ZEBULON--Emma Jean Pace Pippin, 92, died Sunday, September 23, 2018. Emma Jean Pace Pippin was born in Wake County to the late Percy Page Pace and Middie Lucille Green Pace. 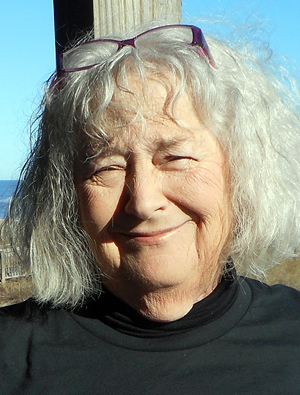 She graduated from Duke University in 1946 and, following her passion, spent a long career educating the students of Laurinburg, Middlesex, Wakelon, and Zebulon High Schools in English. FRANKLINTON--Jonathan "William" Caudle, 20, died Friday, September 21, 2018. He was born August 19, 1998 to Bert and Deitre Caudle. 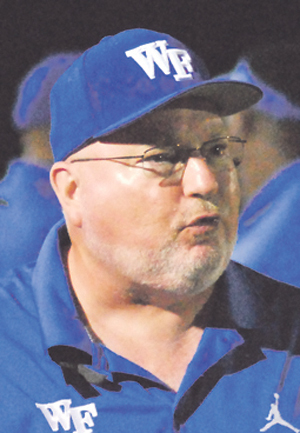 WHITAKERS--Funeral services for Quinton Ellis Richardson, 57, who died Tuesday, Sept. 25, 2018, will be held Saturday, Sept. 29, at 1 p.m. at Pleasant Grove Baptist Church in Hollister, with the Rev. Felix Pettaway officiating. Burial will follow in the New Life Church cemetery. EXTRA YARDAGE. Franklinton quarterback Kenny Cornell falls forward while being tackled during last Friday night's home contest against Wake Forest. 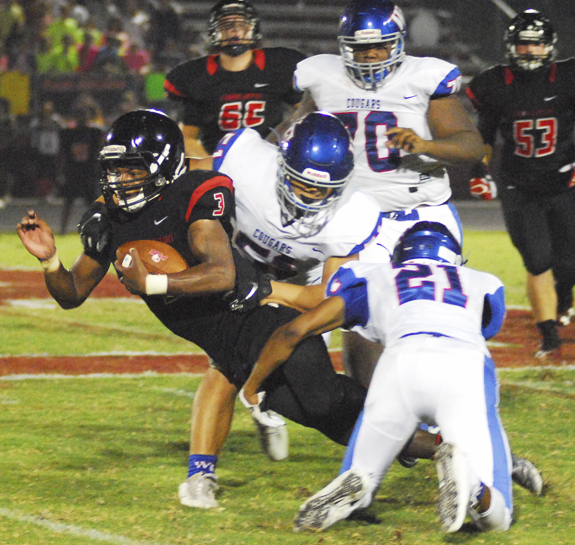 FRANKLINTON -- Maybe even more than a victory, Franklinton was seeking overall program respectability during its home football contest last Friday against powerhouse Wake Forest. UP FOR GRABS. 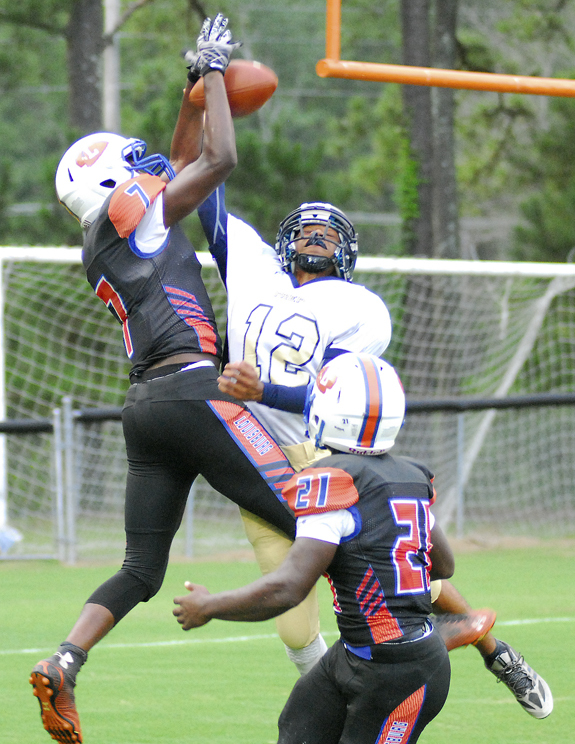 Louisburg High School's Malik Davis (left) leaps in an attempt to bring in a reception during Monday's home victory over Rocky Mount Prep. LOUISBURG -- Most football coaches will agree that it's important to get back on to the field quickly following a loss. 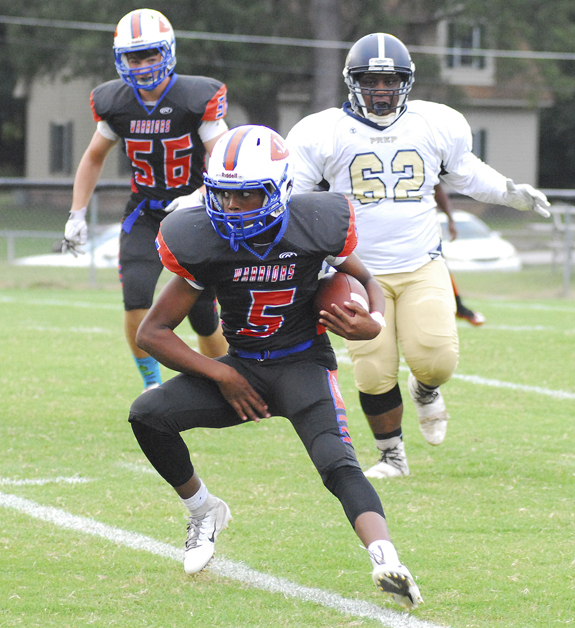 But for the Louisburg Warriors, that opportunity came much faster than usual Monday as LHS hosted Rocky Mount Prep for a make-up game at Patterson Field. Just three days earlier, Louisburg had been drubbed on the road against powerful Northern Carolina Conference opponent South Granville. BUNN -- Even with all of the offensive gimmickry going on in football, there is something about the power game that is still appealing. And Terrell Lane utilized that style to take its Middle Athletic Conference giridiron opener Monday against homestanding Bunn in a rivalry showdown. 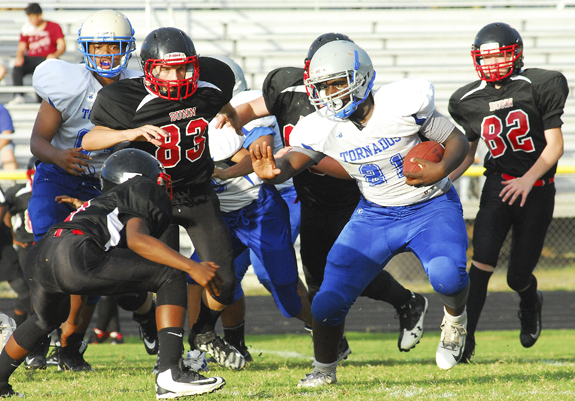 Running mostly between the tackles and keeping things simple, the Tornados were efficient on offense while registering a convincing 30-14 conquest in a game that was played at the Bunn High School Football Field. 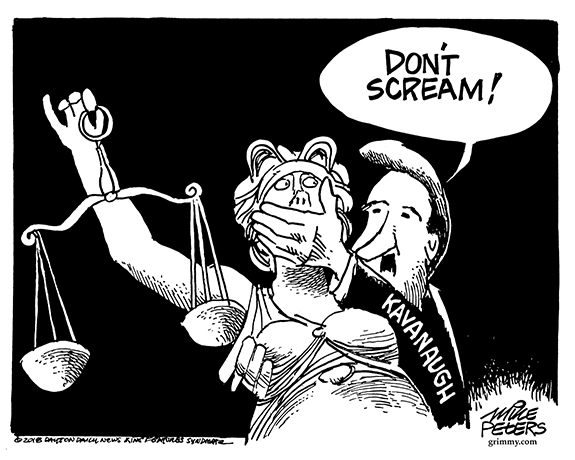 POWERFUL DISPLAY. 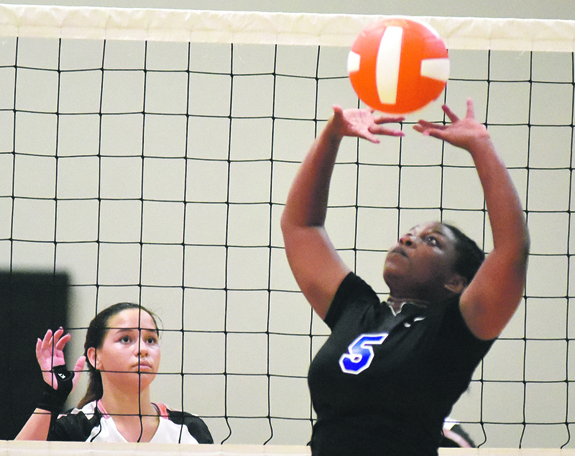 Franklinton High School's Jericka Brodie (right) goes up for a kill during last Wednesday's home spike decision over the Bunn Ladycats. 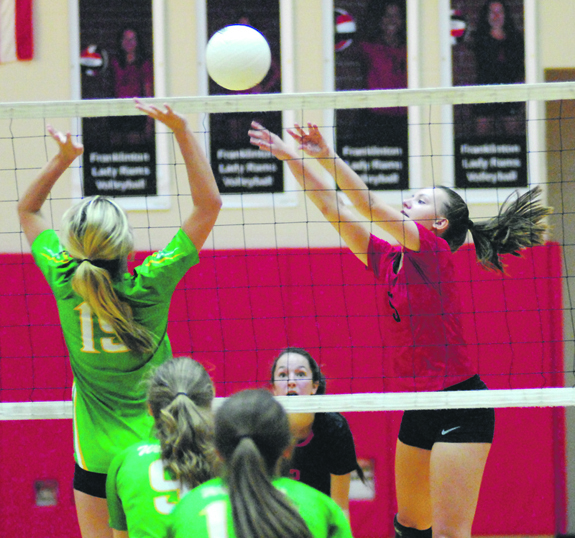 FRANKLINTON -- With their talent, passion and depth, the court seems almost tilted when skilled members of the Franklinton High School volleyball squad get on a roll. 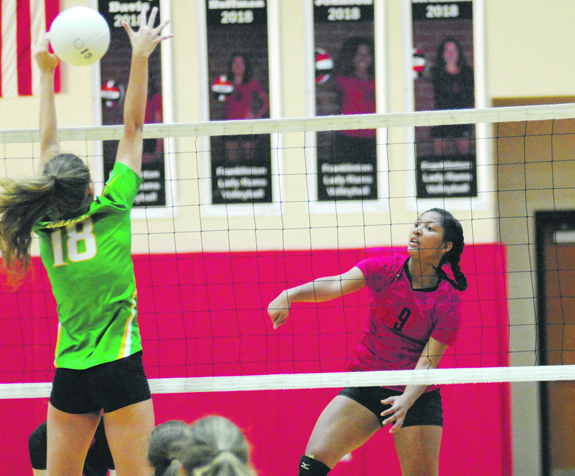 That was the case last Wednesday as Franklinton hosted county rival Bunn, looking to sweep the series over the Ladycats in a matchup of long-time spike foes. After breaking open a tight first set, the Lady Rams rolled to a 25-17, 25-13 and 25-19 triumph over Bunn at the FHS Gymnasium. Bunn, thanks to an off week and a postponement due to poor weather, hadn't been in action since Aug. 30 against rival Southern Nash. 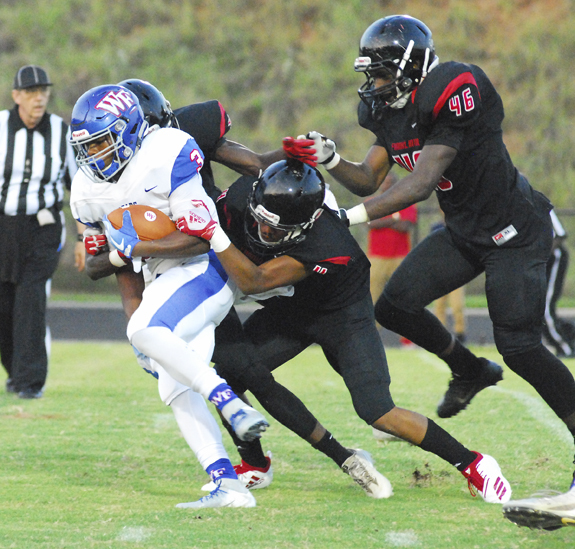 But the Wildcats were effective from the get-go last Friday during their Northern Carolina Conference opener on the road against Oxford Webb. LOUISBURG -- Making the state finals is always the chief goal for the Louisburg High School volleyball team. But other goals pop up as the season progresses, and one was presented to LHS following the opening match of the 2018 campaign. 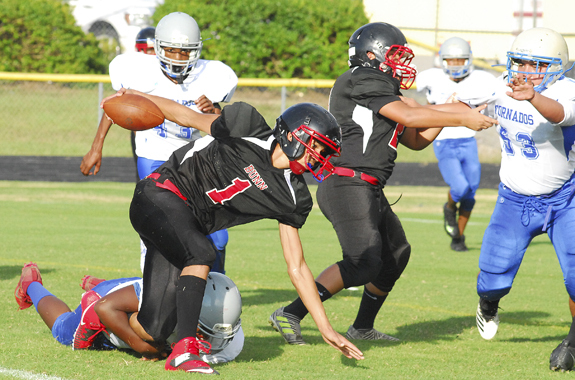 During that event, Louisburg fell at home to Falls Lake Academy. Like LHS, Falls is expected to be one of the Top Class 1-A programs in the East Region, so this was a benchmark showdown for the Lady Warriors. Kickball event targeted for Nash County in Oct.
CHAPEL HILL -- The first annual Nash UNC Cardiopulmonary Rehabilitation Kick-Tober Fest Kickball Tournament will be held Oct. 6. The double-elimination format will be held from 8 a.m.-6 p.m. and will feature 16 teams with 8-15 players per squad. Food trucks will be on site, and all proceeds will benefit Nash UNC's Cardiopulmonary Rehabilitation Assistance Fund. RED OAK -- Franklinton continues to make progress in the ultra-competitive Big East Conference cross country standings -- especially on the boys side. The Red Rams took fourth place as a team in the latest six-squad league event last Wednesday at the Red Oak Middle School course in Nash County. FHS boasted four Top-20 finishers, three of which were underclassmen. RALEIGH -- The 21st annual Skate with the Canes event will take place on November 15 at PNC Arena. Skate with the Canes is one of the most interactive, all-access, behind-the-scenes, player-friendly events benefitting the Carolina Hurricanes Foundation. This event allows fans and players to interact in an intimate environment by rotating through autographs, locker room photos and skating sessions in small groups of 200. Bunn Middle School's Demarion Watkins tries to maintain his balance during Monday afternoon's home football meeting with the Terrell Lane Tornados. Louisburg's Turan Alston turns the corner to avoid a Rocky Mount Prep defender during Monday evening's non-conference football meeting at historic Patterson Field. Franklinton's Britney Davis (right) executes a push for a winner during last Wednesday's home volleyball contest against rival Bunn. Wake Forest High School's Maquel Haywood (with ball) churns toward the end zone during last Friday night's football contest against host Franklinton. A CENTURY AND COUNTING! 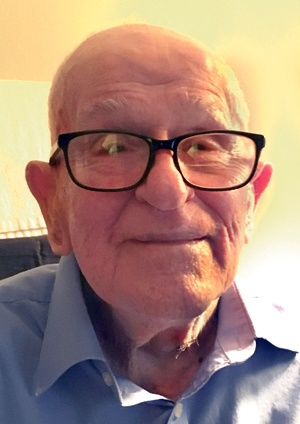 Calvin H. Spann of the Pilot community celebrated his 103rd birthday on Sept. 22, 2018. Spann was born near Batesburg, S.C., and served in both the United States Army and the United States Air Force. He currently resides in Louisburg. YOUNGSVILLE -- The Youngsville Board of Commissioners agreed to supplement grant funding to provide a school resource officer at Youngsville Elementary. The school system secured a nearly $200,000 grant to help cover the cost of putting full time officers at each of the eight county elementary schools. That deployment put a full-time officer at every Franklin County public school, save for the Early College High School. Prior to this fiscal year, four deputies were split between the county's eight elementary schools. FRANKLINTON -- Sheriff's deputies are looking for suspects who shot a convenience store clerk during an apparent armed robbery. The clerk's injuries were not life-threatening. According to authorities, two men wearing masks over their faces entered the Marathon gas station in the 3300 block of U.S. 1 at about 10:15 p.m. on Sept. 22. LOUISBURG -- A Franklinton man was killed last week following an all-terrain vehicle accident. According to Trooper J.T. Southerland, Jonathan Caudle was riding his ATV along Airport Road the evening of Sept. 21 when the vehicle flipped and ejected him. There was an apparent issue with the left front of the vehicle prior to the fatal crash. Six North Carolina authors will be selling and signing copies of their books at the Franklin County Arts Council Main Street Gallery, 118 B North Main St. in Louisburg from 6 to 8 p.m. Friday, Oct. 19. The signing is part of Louisburg's Octarberfest and the gallery will be open to meet the authors. ISSUES DISCUSSED. 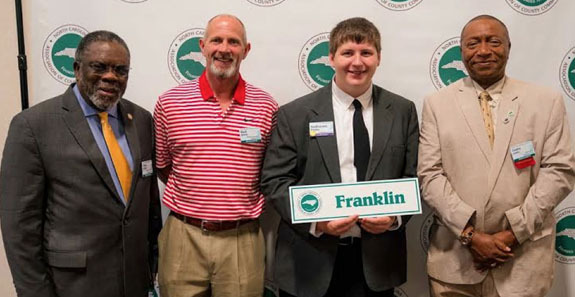 Nathaniel Potter, Franklin County 4-H'er, attended the NC County Commissioners' Annual Conference recently in Hickory and was able to discuss youth issues, not only with Franklin County commissioners but commissioners from across North Carolina during the event. POSING PRETTY. 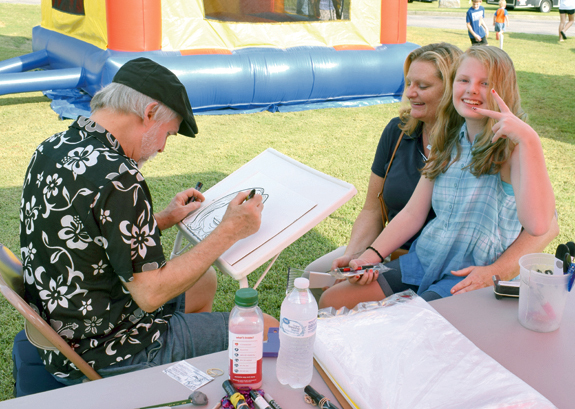 Rachel Cox and daughter Alex Cox pose for caricature artist Bruce Stevenson during Franklin County Farm Bureau's customer appreciation day on Sept. 20.